The husband and wife, director and writer duo of Lawrie Brewster and Sarah Daly arrived on the indie horror scene in fine form with the confident and creepy 2013 debut Lord of Tears (aka The Owlman), which almost immediately became a cult classic on the strength of its Lovecraftian mythology, brooding atmosphere, and darkly beautiful cinematography. The tale of a man returning to the creepy country estate where he grew up to confront his childhood nightmares and long-buried family secrets, and instead finding his dreams and reality haunted by a slender demonic figure with the face of an owl, it was exactly the sort of strong debut feature which was bound to set the trajectory of Brewster and Daly's careers, in more ways than one. They followed that film with an even stronger second feature, The Unkindness of Ravens, which once again used bird-inspired horror imagery and rural isolation, this time in service of a haunting psychological portrait of a PTSD-suffering Afghanistan vet facing down his personal demons. 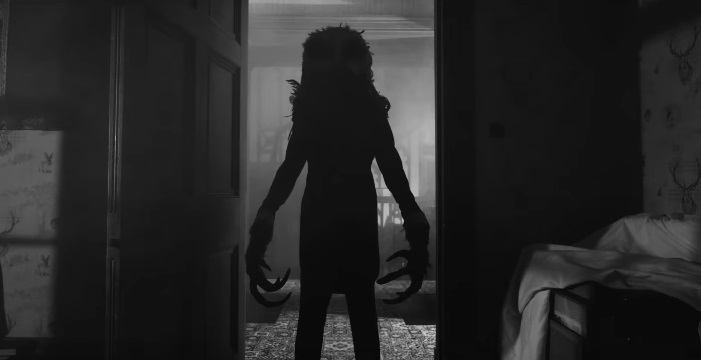 But the power of the Owlman proved impossible to stay away from: Brewster took what he learned from the experience of his second feature and went back to Lord of Tears to make a revamped director's cut which polished some of the first release's rough edges and more fully realized the film's potential. Then for his and Daly's third feature they decided to go back to the mythology of the Owlman yet again - this time for a prequel story. The Black Gloves is that prequel. But despite being set in the same countryside manor house and delving into the mythology of the same demonic figure, it is not simply retreading familiar ground; far from it. 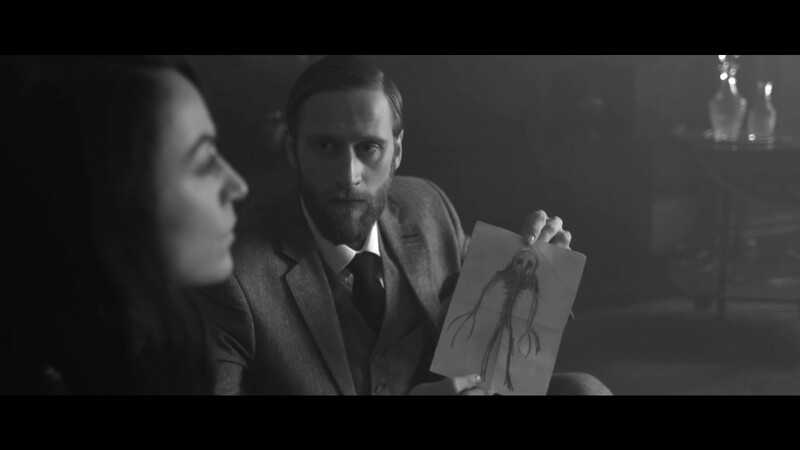 Shot in black and white and set in the 1940s, this is a stylistic homage to classic Hollywood Gothic and to vintage Italian horror in the giallo vein; James Whale meets Mario Bava. In that sense, it is the most ambitious of their three features so far, and while I am not sure if it is quite able to surpass the stellar The Unkindness of Ravens as their best, it is certainly up there. The film stars Brewster's favorite leading man Jamie Scott Gordon (star of The Unkindness of Ravens and co-star of Lord of Tears) as a psychologist haunted by the death of a patient who suffered from nightmares of a family curse and an owl-headed demon. 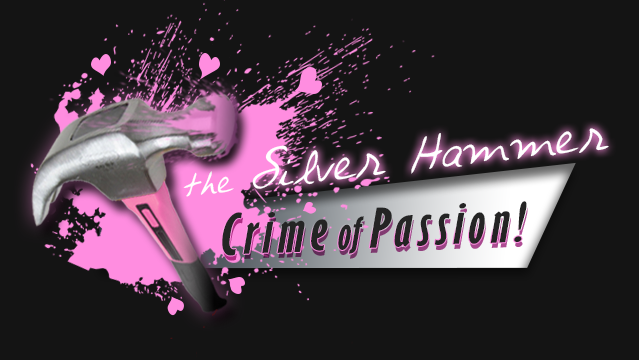 When he learns that the exact same delusions are shared by a famous ballerina (Alexandra Hulme, also of Lord of Tears) who recently disappeared from the spotlight after a psychotic break, he becomes obsessed with solving the mystery, and works his way into a position as the ballerina's therapist. But his rational assumptions about the world are about to be badly shaken when he moves in with the ballet star and her domineering instructor (Macarena Gomez, who is surely by no coincidence a striking doppelganger of Bava-regular Barbara Steele) in the sinister country house where the dancer grew up – a house central to the nightmares about the Owlman shared by both his new patient and his deceased former one. The story unfolds as a brooding, slow-burn Gothic mystery, centered around the psychologist's desire to understand how these two women could both share the same nightmares of the same frighteningly specific figure, when the obvious explanation – the Owlman is real, and something genuinely supernatural is happening at the estate – is, according to his worldview, absolutely impossible. "I'm here to figure out how many licks it takes to get to the center of YOUR SOUL!" While Lord of Tears entered into outright horror territory a bit faster, The Black Gloves takes its time, with the push and pull between the flashes of Owlman-focused horror and our protagonist's insistence that that there must be a rational, psychological explanation playing out as something of a game of cat and mouse. This makes The Black Gloves a different sort of film than its predecessor in a few key ways. While the Owlman was very much present as a character in Lord of Tears, right down to having a few creepy monologues, he is scaled back here into a shadowy presence that pervades the film but isn't overused. The less-is-more philosophy when it comes to the use of the Owlman gives him a bit more mystique, adds to the sense of him being a Lovecraftian ancient-one type of figure, and makes his appearances a bit more impactful in their creepiness. This film is also much more ensemble-focused in its character development, with the interplay, shifting allegiances, and holding of secrets between the film's three central characters forming the backbone of the plot. Lord of Tears already established what the Owlman is and what he does (though that is recapped here for newcomers – seeing that film first is not required), so that frees up this story to explore the mystery of ballerina Elisa Grey's history, and how her life and her psychological traumas are tied to the house and the demonic figure which resides beneath it. This different focus and slow-burn ensemble-piece approach meshes extremely well with the film's stylistic conceit, as a retro-style throwback to both Europe and Hollywood's Gothic past. The movie wears these influences very heavily on its sleeve in the opening credits, which are styled after those you might see in a 1930s Universal Studios monster movie, but the film isn't as specifically anchored in the past as those credits seem to indicate. The atmospheric cinematography and lighting doesn't restrict itself to the style or technology of 30s Hollywood, but also takes stylistic cues from Hammer's classic horror films and the Italian genre pioneers like Mario Bava, and the whole thing has a distinctly giallo feel. 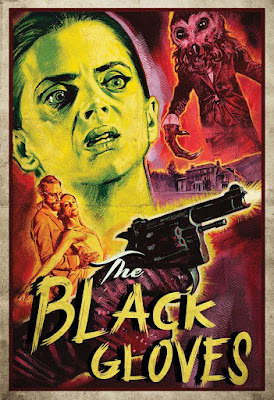 One must assume that the title is itself an homage to the giallo subgenre, for which black gloves worn by the killer are one of the most iconic symbols; not to mention that a supernatural horror movie set in the world of ballet immediately conjures up thoughts of Suspiria. The overall effect is a love-letter to horror's cinematic past, taking cues from various eras in the genre, but mixing them into a whole that is stylistically cohesive. It is definitely a film made by lovers of classic horror for lovers of classic horror. Between the highly stylized approach of the film and the intimate ensemble of essentially just three characters, a whole lot rides on the shoulders of Gordon, Hulme, and Gomez to make it work – and all three are up for the challenge. We get to see a different side of Jamie Scott Gordon's range this time around, and he impresses: while his characters in Lord of Tears and The Unkindness of Ravens were fairly similar (decidedly modern psychologically troubled young men with scraggly long hair), here he gets to go rather against type in a straight-laced, scientifically-grounded period role. As with The Unkindness of Ravens, the movie is first and foremost about his character's psychological journey, and again he proves that he has more than what it takes to carry a film. Hulme is once again very memorable in an ethereal, haunted performance with more than a few echoes of her Lord of Tears role. 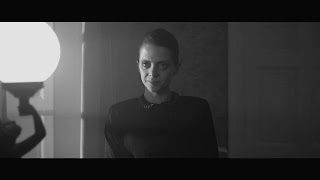 Gomez, meanwhile, plays the character of the mysterious and abrasive ballet teacher just a step away from being too over-the-top: she absolutely recalls the somewhat arch, melodramatic performances of Italian horror classics like Suspiria, yet she keeps it just restrained enough that it works rather than going too far. 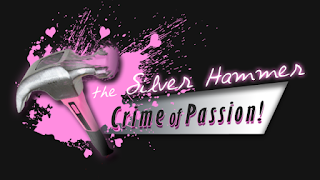 The vintage black and white aesthetic probably gives her more room to have fun with the role and take it as far as she can without breaking plausibility, and she ends up being quite a scene-stealing character. If the film has a flaw, it is that at 80 minutes it is just too short. It works beautifully when it is in slow-burn mode, but that isn't quite enough time for a slow-burn horror film to really do all it can; what is here is great, but it could have used a bit more room to breathe. Aspects of the characters could have been fleshed out a bit more, but in particular the mythology really could use more time to develop. Granted, we know plenty about the Owlman's history from Lord of Tears, but there are certainly additions to the mythology in this film that I wished it had explored more, and aspects of the third act that could have used a bit more room to breathe. But in the end, the film works perfectly well on its own; I do wish that it had been longer, but that's mostly because what we got is so strong that it easily could have sustained, and benefited from, a longer runtime. 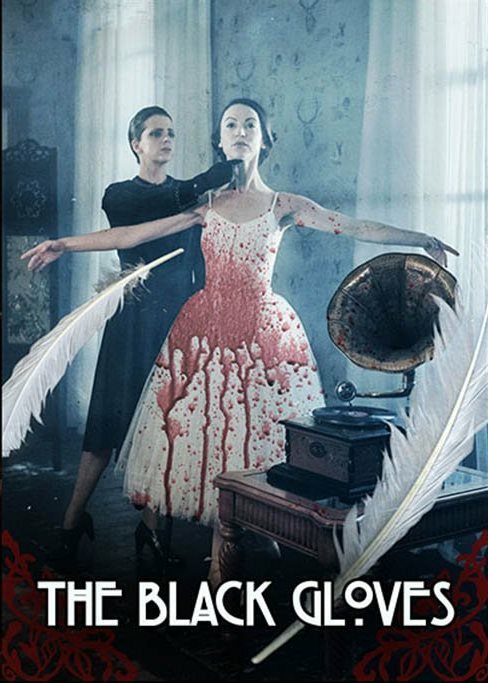 The Black Gloves is currently available on-demand via Amazon Prime. Brewster and Daly's Hex Media has also self-released a beautiful blu-ray/DVD/soundtrack CD box set, although for the time being it is only available through rewards packages for the Kickstarter campaign for their next horror film, the excellent-looking Automata (though it may still be available through other indie distributors like DiabolikDVD). Presumably once that Kickstarter is done, the blu-ray will once again be available through the Hex store, but in the mean time, getting it as a reward for funding their continued indie filmmaking is a pretty cool way to buy, and I'm glad that they have made it available on-demand for those who aren't quite ready to blind-buy a not-inexpensive box set. Brewster and Daly's Hex crew have proven themselves once again to be among the most interesting indie horror auteurs at work today. The Unkindness of Ravens may still hold the distinction of being their best film to date, but The Black Gloves isn't far behind. With its moody black-and-white Gothic atmosphere and its expansion of Lord of Tears' occult mythology, it manages to both build on its predecessor in an interesting way while also being very much its own beast. For fans of Lord of Tears or those who would enjoy a cinephile throwback to several veins of vintage horror, this film is certainly recommended. Share this review, or else the curse of the Owlman will be upon you.